Bob KK4DIV and I located at Leslie Porter Wayside Park EM70EG20. My intended location St Andrews State Park. However that park was consumed with a foot race. Bob and I chose our pedestrian moble setups. 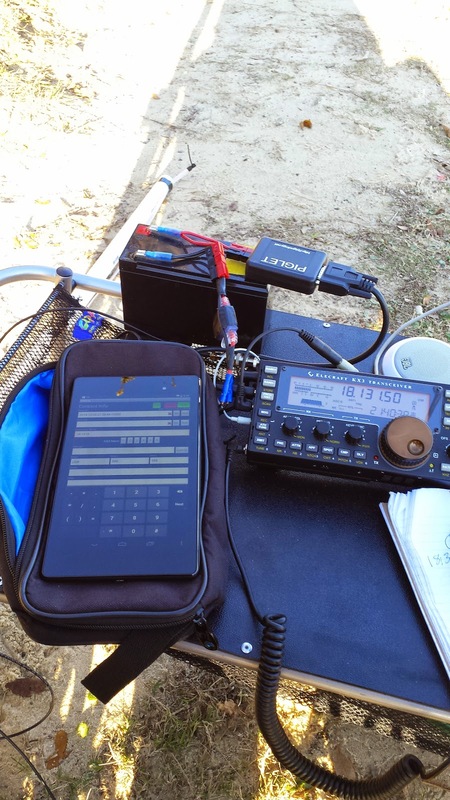 Bob used his FT-817 backpack with a coil and whip. I used the KX3 with the Alexloop. The weather was favourable with blue skies and cool but not cold temps. N4KGL's Alexloop at the bay side. I was on 20 SSB for the first 40 minutes. I worked Bob KK4DIV (he was 60 over S9), Don KK4DWC in Southport FL, then John W8JER in Sturgis, Michigan. John will be coming to Panama City in January to escape the snow. 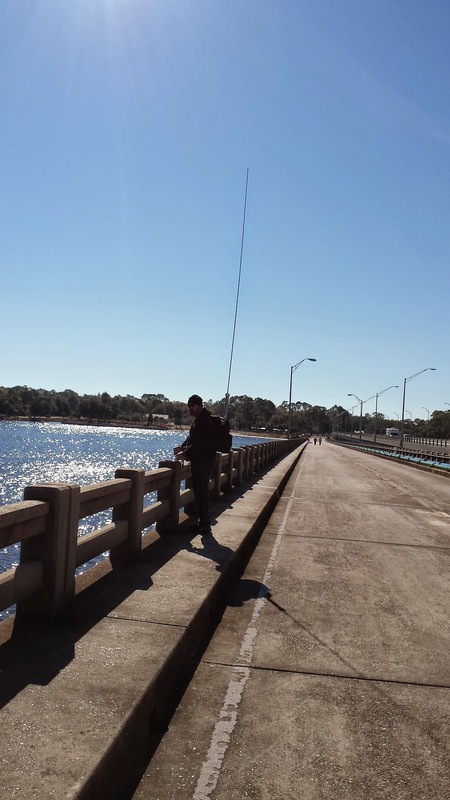 Next was Scott ND9E who was doing RaDAR at EM48XO97FA followed by Phil N4STC/M in Panama City. I switched to 20 CW to finish the first hour. I worked Shawn W5HMB in Mississippi, Rick ND9DX in Illinois. Then I heard a combination of Pat NQ0N in Missouri and Pat N5VMO in Arkansas. Both Pats were a little weak and there was QRM to boot. The second hour I went to 15 SSB and worked John W8JER and his friend Denny N8JGG both in Sturgis. Then I heard Tom G0SBW and got his call right finally. It was fine business to do a intercontinental \PM to \PM RaDAR QSO. N4KGL on the bridge over the bay. At this point Bob and I ventured onto the old bridge over the bay next to the new one. We made it to the peak in the middle. 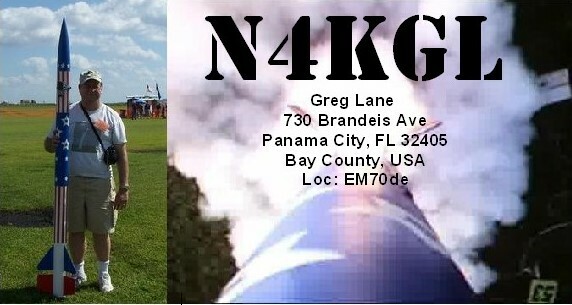 I worked Jack N1HQ in Panama City, FL on 20 meters SSB. Then on 15 meters CW a nice solid copy QSO with John VA3KOT in Ontario. John was a RaDAR Chaser due to the weather up there. We exchanged grids and SKCC numbers. John said I bent his S meter. So the top on the bridge is going to be on my return to list. I also worked Preston WA6OEF in California. Bob KK4DIV/PM was also on the bridge. So why not check our more bands. I worked FM/F9IE in Martinique on 12 meters SSB. Then W0ANT in Colorado and KY7M in Arizona on 10 meters SSB contest. I went to 17 meters SSB and posted on the RaDAR Spotter page. I was called by ND9E Scott for second QSO and he was on his third RaDAR location for the day which was EM58AS38XC. I worked two more on 17 meters SSB. 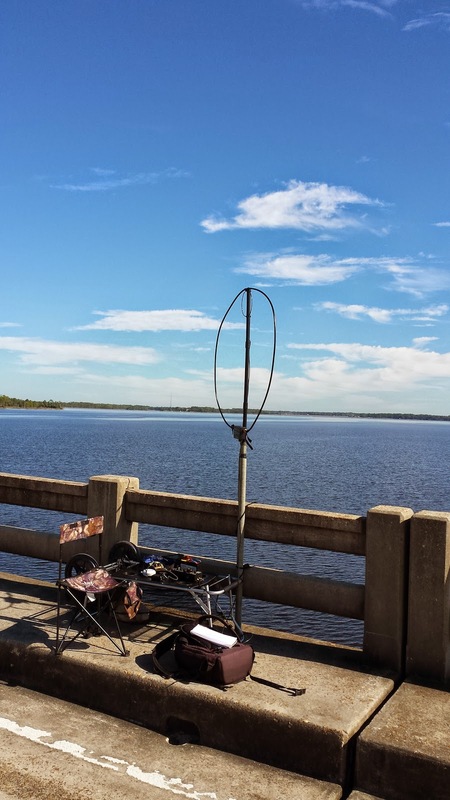 They were W0PZD in Arizona and N5RK portable in Texas. Lots of good reports on the Alexloop. So LOOP plus SALT WATER equals FUN. I was pleased to met several RaDAR folks on the air. Likewise, a nice time with Bob KK4DIV doing RaDAR at the same time and same park. Perhaps we could have walked enough for a second location. We will try for that next time. It was a bit of exercise with the \PM gear. 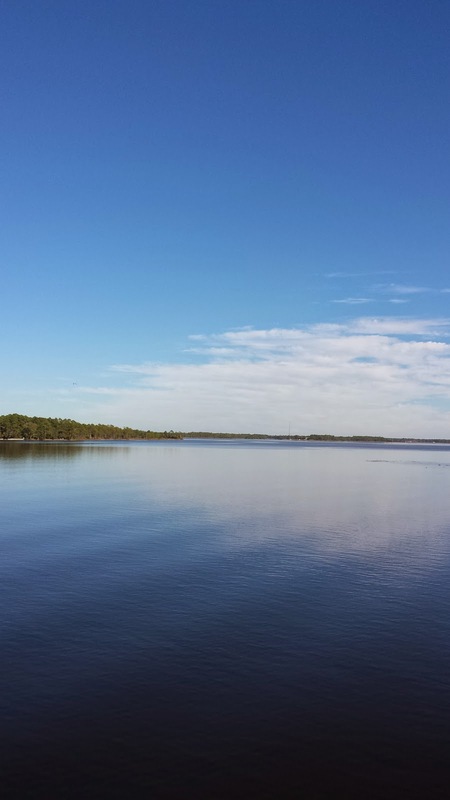 Wayside Park in Lynn Haven, Florida. On Saturday, I operated from the SouthEast Alabama Rocketry Society launch in Samson, Alabama. It was a very foggy morning. I setup a 40 meter dipole and the rig was my Icom 7100 on a 30 amp hour battery. As we know the dipole is a a great performer for portable ops if you can get it up in the air. I got the center up about 30 feet with a Jackite pole. The ends were at little less than 20 feet using the smaller fiberglass poles. I used a 70 foot run of coax to locate the antenna 40 feet behind the flight line. On this coax I did not have the ferrite beads for a choke but hey it worked fine anyway, I actually started out on 15 meters. The SWR was over 2 to 1. The Icom 7100 does not have a tuner so I used a compact MFJ 901b tuner. I recently picked up this tuner at our local club. The tuner worked fine and I am going to include it in my high power go box. I had a advertised that I would be on 40 meters among the RaDAR community and local hams. It was a pleasure to make a RaDAR to RaDAR contact with Bob KK4DIV. He was camping with the family at Laurel Hills in Northwest Florida. Bob was using his FT 817 and a random wire in a tree. His signal was solid copy and up to S7 at my location. Note this contact qualifies for a 5 point bonus in the RaDAR Rally. 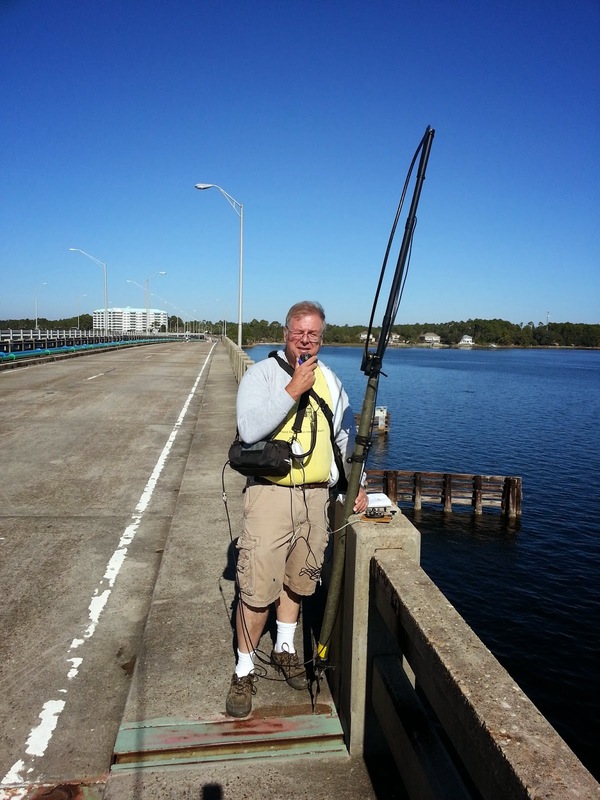 I also worked two Panama City Florida hams Bob WB4BLX and Vic K4GXV on 40 meters SSB. 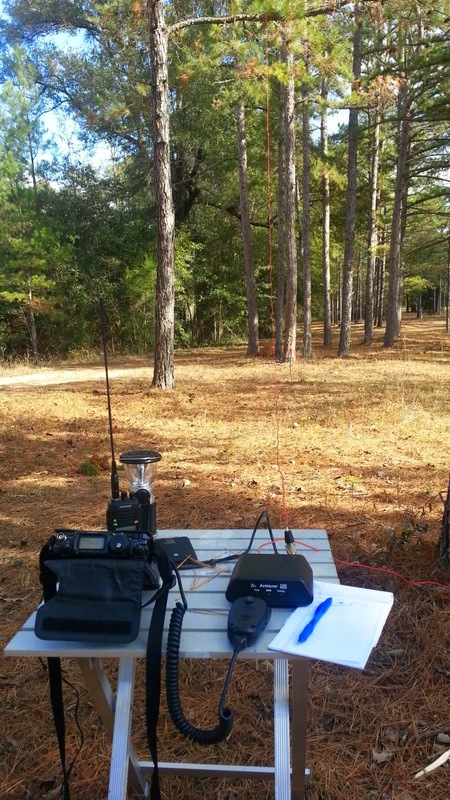 Bob KK4DIV's setup on his camping trip. I spent saturday night in Dothan, Alabama with my Parents. On Sunday afternoon. I setup the Alexloop and the KX3 in the backyard, I got five contacts in on 20 and 10 meter CW. The best contacts was with Bert F6HKA. Bert is an outstanding operator and is a Senator member in the Straight Key Century Club. So I picked up five Rally points, one point per QSO, at each location. I toyed with moving to a second location each day to pick up five more at two points each, But I ran short on time. You can find out more about the Rapid Deployment Amateur Radio (RaDAR) Rally at this link. My launch of a Warthog rocket on a G motor. Last Sunday, I made yet another outing to St. Andrews State Park near Panama City Florida. My goal was to take advantage of the salt water effect for vertical antennas. On the North side of the park there is a pier over the Grand Lagoon. I got out to the end and setup with the Alexloop. I made my five contacts for the RaDAR Rally rather quickly. These included with my report VE3AXW Ontario 53, SM5AQD Sweden 55, AJ2I New Jersey 57, KF4WMB Virginia 57, K4GXV Florida 59. This is not bad for the Alexloop at 10 watts SSB. Note that SM5AQD called me. So having five contacts at the pier, it was time to move 1 kilometre to Sandy Point. The Alexloop at the end of the pier. Sandy Point has many angles over salt water. I actually brought two N6BT Bravo 7K vertical dipoles. and set them up as a parasitic array for 10 meters. They hopefully were pointed to the Northeast. First contact was EA5NW who was impressed with my signal but I did not get a S value. Followed by G4ZWY 55, NP3RE 59, EA9IB 57, and N1GGG 45. Around noon I redirected the array toward the Northwest. I worked AC7AV Eric in Washington State for about 30 minutes. He gave me a 58. I dropped the reflector and he noted a small drop but not all that noticeable. I also had the the Alexloop on a switch. The Alexloop had a S unit or two drop below the verticals on receive. The loop was quieter than the vertical. Eric had no problem working me on the loop. Getting close to pack up time, I was called by KC1CMF running 10 watts in Massachusetts who gave me a 59. Then KD0VNQ in Colorado gave me a 44. My last contact was Phil N4STC who was local. He gave me a 59 and did not notice much change when I dropped the reflector. But when I put the reflector between me and Phil the signal went down to 55. It is a bit hard to be scientific but I found that the DX came easy on this outing including stations calling me. I would put the Bravo 7K ahead of the loop but on my test I could still carry on the QSO with the loop. I think the gain of the array is modest and was not that noticable state side. I would like to have a DX contact report with and without the reflector. The front to back on the array is dramatic in any case. The KX3 on my beach cart that doubles as a table. 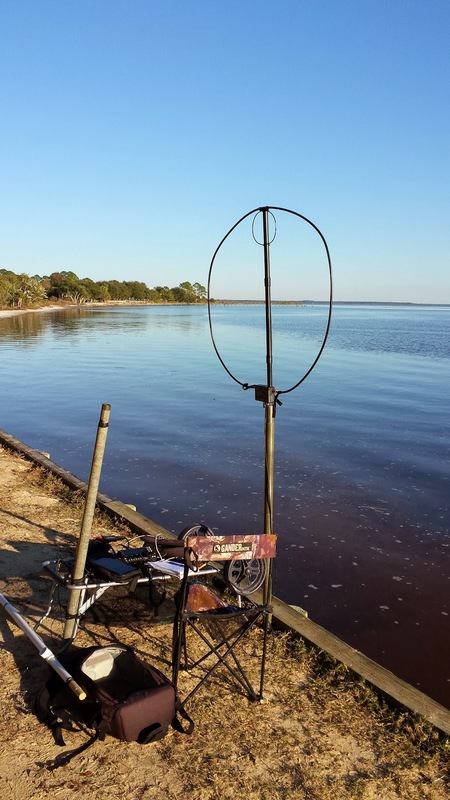 As you may know Sandy Point at St Andrews State Park is my favorite portable QTH. Since Sandy Point was my second location on this outing, the first five QSOs counted two points in the RaDAR Rally. I did have a local fisherman Ron witness the DX contacts. I had a boater pull in and ask what I was doing. I saw a dolphin out in the channel and of course the pelicans. This is hard to beat. 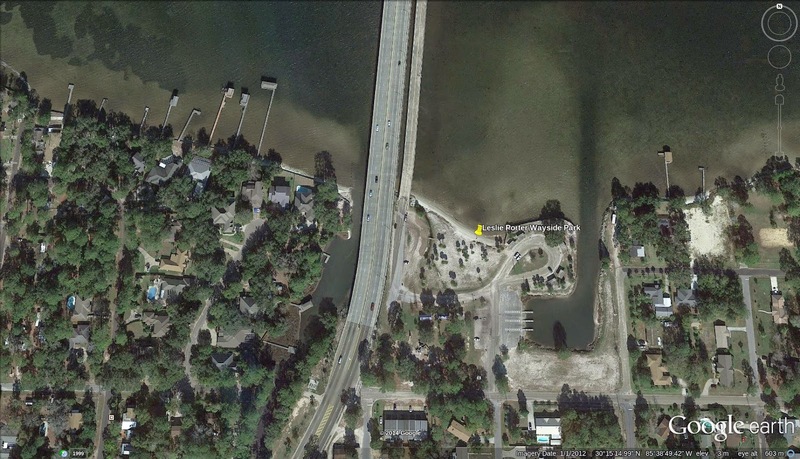 I have since learned that there is a shuttle boat to Shell Island across the bay from the park. The shuttle will start running in March. I think that would make a fun excursion for RaDAR to operate from the park and the island on the same outing. You can find out more about the Rapid Deployment Amateur Radio (RaDAR) Rally at this link. The pier was at the dock area and then I walked to Sandy Point. Shell Island is across the channel to the South-East.